Everyone needs a bag. Commuting to work without one is next to impossible. Travelling without a carry on is impractical. Even a day off requires packing up some stuff – while running errands or chauffeuring the kids. A quality duffle bag can assist it’s owner virtually any time they’ll need to transport more than just wallet, cellphone, and keys. Many things are required to get through a busy day, so everyone needs a reliable bag. Briefcase: Upgraded from a regular sports duffle, this bag has good reasons to be a work bag of choice. With a stylish design and polished appearance, think of it as a briefcase’s cooler cousin. Courier Bag: Do your employees need to lug around multiple items during the day? This duffle is a great courier bag. It provides a quick and efficient way of getting equipment to where it needs to go without straining shoulders. Weekender Satchel: Whether on the road or in the air, sometimes a weekender bag is all the luggage you need. This bag is an excellent way for your salespeople to save time by staying away from the luggage carousel. The perfect carry on luggage, this duffle protects and safeguards your belongings. Backpack: Books, notes, binders, and other supplies – it seemed we could stuff them all into a backpack in college. This bag can hold the same amount and it’s just a bit more grownup than a backpack. The middle compartment is large enough to hold a huge number of books. Whether reading for pleasure, studying for a training course or reviewing business plans, this bag will hold up to heavier items. Plus, the outside pockets keep things organized. 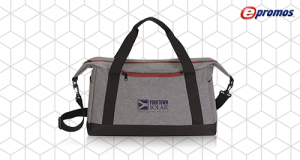 This bag works for recipients across any industry, and won’t give the impression they’re living in a dorm. Tote: Consider gifting this as an everything tote, designed to carry documents, cellphone, USB flash drive, umbrella and even lunch. This bag can also be used to store a change of clothes for evening events or work dinners. Tech Bag: Not only will this bag hold a tablet and laptop, it has extra pockets for cables, chargers, adaptors, and a computer mouse. Add your tech-business logo and your new brand ambassadors will be ready to go. Diaper Bag: There is absolutely no reason for your customers to spend oodles of cash on a diaper bag. This bag provides the same great help for parents. A big compartment for diapers, formula, bibs and a couple changes of clothes; and smaller exterior pockets for bottles and other supplies. We love this item for hospitals, doctor’s offices and daycares. Extra Sack: It’s the ideal bag to tuck away in checked baggage for extras on a return trip or if something happens to your employees’ luggage. This duffle is small enough to be considered a carry on bag, flexible enough to fit in the overhead bin, and roomy enough to stuff all those souvenirs. You can be sure recipients will get good use from this bag. Beach Bag: Recipients can easily pack a towel, sunscreen, snacks, and sand toys in this bag, making it ideal to take to the beach. Great for company outings, too! Gear Storage: If the recipient doesn’t use this bag for business or travel, it can be used to hold gear and miscellaneous items that need a home. This bag will fit nicely into whatever space is available. It’s also nice enough to keep and store art and craft supplies or small toys that will always be ready for a road trip. Sports Duffle: The gym is a part of so many people’s daily routine, many of whom go straight from work. This bag is a spot-on option because its refined look fits into an office setting, yet it’s durable enough to survive hundreds of trips to the gym. • One of the first packing tips you’ll find on every packing list published is NOT to pack bulky coats and sweaters. The key is to layer your clothing instead. Clothes that layer well take up less space and provide more things to wear. Go for multi-functional garments where possible; things you can see yourself wearing in different situations or using for different purposes. • Pack each day’s clothes (including socks and underwear) in a separate 2-gallon Ziploc bag or packing cube. This makes it easy to find the day’s clothes in the morning. You can use those same bags for dirty clothes or other storage. • Roll your clothes to efficiently use duffle space and to keep clothes wrinkle-free. Most of what we bring in our carry-ons or suitcases is air. So, the more of it we can squeeze out, the more stuff we can fit in. • Pack clothes with a similar color palette so you can mix and match outfits and layer clothing that coordinates. • If your hat needs to be packed, fold a shirt and put it in the inside of a hat. You’ll conserve space and keep your hat from getting squished. • Put rolled up socks inside your shoes. They help your shoes keep their shape and save on space in your duffle bag. • Instead of packing a pillow from home, just bring a clean pillow case filled with clean clothes you’re going to wear. • Pack a few dryer sheets to stop unwanted odors. Bonus: when dining outdoors, you can also use a sheet underneath the tablecloth to keep the bugs away! • Place an extra pair of shoes in a shower cap to keep dirt away from other items. The shower cap can also be used – well – as a shower cap. • Double bag any travel-size toiletries to keep them conveniently stored and to save the rest of your luggage from leaks and spills. Or put some plastic wrap over the openings of shampoos, lotions, and creams and then screw the caps back on. • Place heavier items, including your shoes and hiking boots, at the bottom of the duffle bag. Place toiletries close to the bottom, too, and then put lighter clothes close to the top of your bag. • Everyone’s bags will look alike when you go to claim them. Make yours stand out by tying on a colorful bandana on the handle. Now you have a bandana or buff to wear without taking up space in your duffle. You can also mark your duffle with a luggage tag or brightly-colored duct tape. • If your feet hurt at the end of your day, you can use your duffle bag as a foot rest to keep your tootsies elevated during the night. Warning: this technique works great if you’re sleeping on a yoga mat or sleeping mat – not so well on an air mattress. • Sometimes you’re headed to cold weather regions and you’ll need a bulky coat. Don’t pack it. Wear it onto the plane to save duffle bag space and to give you a comfy pillow during the flight. • Finally, a good packing list is priceless. Having the necessary supplies and equipment makes a difference in everyday life and could mean people enjoy their day because they have what they need, packed right. Don’t forget to make a packing list before you begin! Call us today, your Promo Know-How People to talk about how this duffle bag fits in with your next project.